Long John Silver’s has announced an offer that will have Americans clamoring to “climb aboard” and indulge in the one-of-a-kind taste they’ve grown to love and crave. On June 28, 2014 from 11:00 to 3:00 p.m. at participating locations, Long John Silver’s will give one crispy golden fish filet and a serving of natural-cut fries to every guest who visits the store (dine in or carryout only) completely FREE of charge. 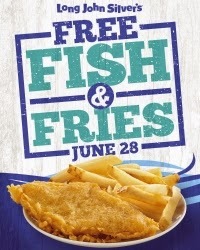 Free Fish & Fries is just one of many special offers and events that Long John Silver’s will announce over the coming months as the restaurant sets out to surprise and delight its customers with the mouthwatering seafood they love and crave all summer long. “We want everyone in America to enjoy the craveable, one-of-a-kind taste that only Long John Silver’s can serve,” said Kern. Want a FREE drink to go along with your FREE Fish and Fries meal? Use your smartphone to Text "FISH" to 41522 to join the Long John Silver's Fishbowl Club and they will send you an e-coupon for a FREE large drink (no purchase necessary) - HOLLA to the FREE!!! 3755 E. Eight Mile Rd. Make sure you contact your local Long John Silver's location to see if they are participating is this FREEBIE offer.